Something extraordinary is happening under London. Six mechanical navvies, bewildering in their efficiency, steer Crossrail’s tunnels through tangled subterranean history towards an end-point later this year. Forever hungry, Ada, Phyllis, Victoria, Elizabeth, Mary and Sophia each mine and line over 20 metres daily to tolerances measured in millimetres; verified by inertial navigation systems, scrutinised from comfy chairs. As enterprises go, this one is exceptional and yet that reality rarely impinges on our consciousness. Why don’t we awe anymore? When something extraordinary happened two centuries ago - and it very often did - inquisitive crowds gathered, cheering and waving flags. Great engineers became celebrities of the day, without ever taking their kit off or eating worms in a jungle. Men of vision and tenacity - Locke, Vignoles, Stephenson, Brunel - forged national transformation. Our leaders today seem content to tinker, deciding what colour to make fag packets. 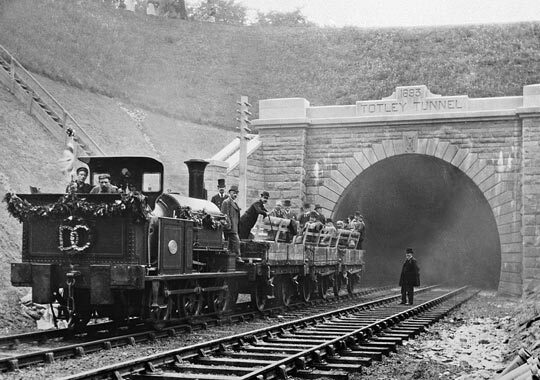 Directors of the Midland Railway prepare for their celebratory trip through Totley Tunnel on 10th August 1893. Trawl through the newspaper archives and it’s clear that tunnels were sources of intrigue and wonder to the Victorians: portals into a new age. But how were tunnels constructed in a Time Before Machinery (TBM)? Keen for answers, I spent much of last summer producing a short film about it, targeted at those amongst the public with an underlying curiosity, but perhaps also of interest to the engineering fraternity. Written insight is not scarce on this subject, but generally accepted as the definitive work is Practical Tunnelling, a tome authored by Frederick Simms who secured the role of resident engineer on the South Eastern Railway in 1836, thereafter recording the tribulations encountered with Bletchingley and Saltwood tunnels. Contractor Charles Gripper published another book, Railway Tunnelling in Heavy Ground, in 1879, apparently unhappy that Simms had “rather hurried over his explanations of mining operations”. Noteworthy amongst the many papers is one exploring the seven-year construction of the first bore at Woodhead - extending for three miles between Sheffield and Manchester - which had been committed to the charge of Wellington Purdon, a surveyor from Killucan, County Westmeath, who was just 23 when he took on the project in 1838. There’s little point cluttering up this space by repeating the film’s content. If you fancy investing 20 minutes of your life on the basics of Victorian tunnelling, a link to the film is provided below. Remember, the script considers a generic tunnel - it is not applicable to every one in existence. In these pages we’ll reflect in more detail on some of the challenges that had to be overcome. 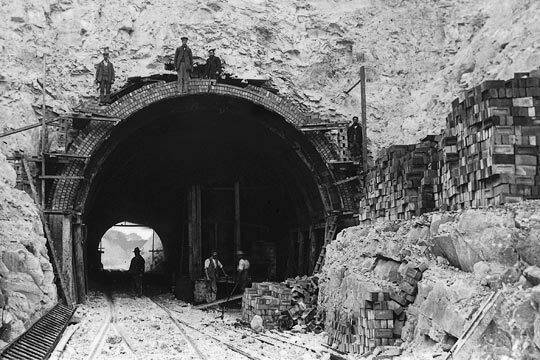 Progress with lengthy tunnels was usually expedited by sinking construction shafts, allowing them to be driven from intermediate points as well as their ends. 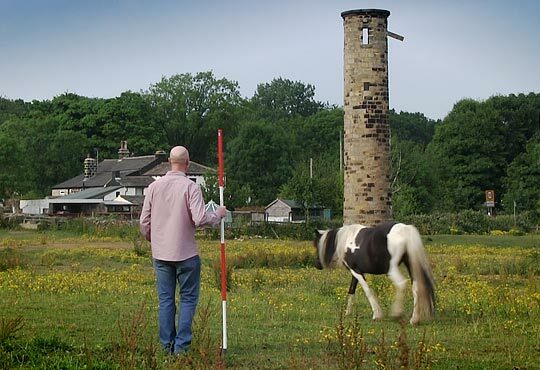 Sighting towers, known as observatories, were erected as fixed reference points for setting out purposes; the tunnel line, and hence the shaft centres, could then be established at any point over the hill. Although substantially built, very few still stand as their valuable fabric was mostly recycled when work had advanced sufficiently. But survivors can be found at Merstham in Surrey and Bramhope on the Leeds-Harrogate line, in brick and stone respectively. Often 30 or 40 feet high, the towers housed a staircase spiralling around a central pier, the latter being entirely freestanding so as not to be influenced by any movement of the building. On top of it was a stone table supporting a transit instrument, typically incorporating a 30-inch focal length telescope which looked out through openings at the top of the tower. Provision of a basic telegraph system enabled the engineer to direct his assistant with the ranging pole. The observatory at Bramhope, used to assist the construction of the 3,761-yard tunnel on the Leeds-Harrogate line. Few disciplines have benefited more from the technological revolution than surveying. It’s a very digital business these days. Simms however helps us understand just how far it has come, describing the means by which the tunnel line was transferred down a shaft. Two fishing lines with 25lb plumb-bobs, secured to a triangular timber frame erected over the shaft, were dropped down either side of it and suspended in water vessels at the bottom to hold them steady. The lines were then ranged from the observatory, with notches cut into the timberwork for each one to rest in when the correct position had been set. It’s hard to conceive what life must have been like at the bottom of a shaft, without the benefit of today’s foul weather gear. Progress downwards was made at a rate of perhaps six feet per week, with two 12-hour shifts worked daily, except Sundays. Shafts acted as sumps, collecting ground water from the locality, prompting navvies to use straw in an effort to stem the flow. This often proved futile and work had to be suspended whilst better pumps were brought. The need to power them was one factor in the early development of steam engines. To give you an idea of volumes, 2.4 million tons of water were pumped from Woodhead’s five shafts whilst they were being sunk. Four navvies prepare to descend the shaft at Cowburn Tunnel in the early 1890s. Water was inconvenient; running sands killed. These loosely-packed layers within the rock can become fluidised, removing support for anything overlying them. Excavation work in such conditions was therefore attended by considerable danger. On 16th July 1835, a collapse at the base of one of Watford Tunnel’s shafts resulted in a vast crater opening at ground level, swallowing all around. Below, ten men were buried; their bodies took more than a month to extricate, after another shaft had been sunk alongside the original. This still offers momentary relief from the darkness when passing through the tunnel on the West Coast Main Line. That so many construction shafts were sealed and backfilled - rather than being retained for ventilation - has left an unwelcome legacy, with records of their location often lost and the land above developed. Typically, the fill material is supported on a timber frame above the arch; if the fill becomes saturated, rotting and crushing of the timbers can follow, leading ultimately to their failure and the load’s transfer onto the lining. Of the five hidden shafts in a North Yorkshire tunnel, closed in 1958, three have given way since the Seventies. Investigations to locate such shafts continue today, their significance in liability terms not lost on duty holders. Pilot tunnels, known as headings and pushed outwards in both directions from the bottom of shafts, performed a number of roles when eventually joined together: to help drain and ventilate the workings, to provide a means of communication between the shafts and, most importantly, to confirm the correct line and level before the tunnel was excavated to full size. 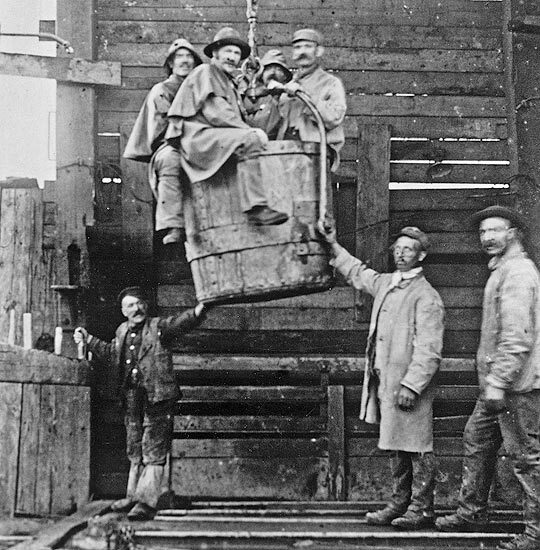 At Bletchingley and Saltwood, the headings were claustrophobic - less than 3 feet wide and just 4 feet 8 inches high: a real pain in the neck for the labourers pushing skip-loads of spoil to the shaft for disposal. It’s clear from Gripper’s book, supported by newspaper accounts and photographs, that more generous headings - between seven and ten feet square - had become the norm before the 19th century was out. 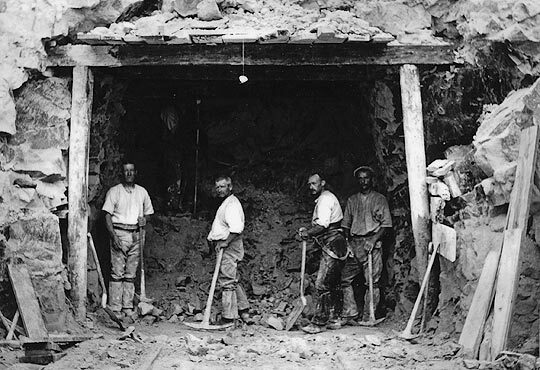 Using mining techniques, 6-8 feet of progress was generally made with a heading in 24 hours, depending on ground conditions. But by the 1870s, an assortment of productivity-boosting devices had emerged, driven by steam or compressed air. Noteworthy was a rock drilling machine, patented by Major Frederick Beaumont of the Royal Engineers and operated by the Diamond Rock Boring Company, of which he was chairman. The machine was set to work in Cymmer Tunnel, as well as Queensbury, Well Heads and Lees Moor on the Great Northern’s Halifax-Keighley line. Powered by an 8hp portable engine, it comprised an array of diamond-tipped steel tubes rotating at 250rpm - cooled by water and delivering a daily advance of about 20 feet. Navvies make progress with the heading of Saunderton Tunnel, the centreline having been confirmed for them by means of a plumb line. The first genuine tunnel boring machine was developed in America in 1851, working to a similar principle as modern TBMs, but it proved less productive than the established drill and blast method. Two other machines, built to Captain Thomas English’s patent, operated successfully as part of an early Channel Tunnel scheme until politics and security fears brought its abandonment in 1882. Through chalk, the 2.13m cutting head drove more than 3,500m of tunnel at a highly creditable 25m per day. Read the Daily Mail and you’d probably conclude that health and safety is now a national scandal. For different reasons, that charge could certainly be levelled at the safety record of Victorian railway companies. The sustained loss of life prompts many to infer that companies had a disregard for the navvies’ welfare, but such an assessment would be over-simplistic. Time after time, inquests heard evidence of habitual rule breaking, albeit - as now - theoretical compliance did not always sit comfortably alongside practical needs. On 21st April 1876, miner Richard Parsons - part of the gang driving the Cymmer Tunnel - was making up charges immediately above his explosives, “in defiance of orders and in disregard of warnings and reprimands”. Inches away, in the cabinet behind him, were 150lb of dynamite. A single candle illuminated the scene; when it fell over there was only one possible outcome. Parsons and a 13-year-old boy, John Clements, were “reduced to atoms”; 11 others were also lost. The workforce proved managerially problematic. Recklessness was endemic, though rarely did it have such devastating consequences as at Cymmer. Long and arduous shifts brought with them a culture of playing hard afterwards. Navvies fought in lumps and drank themselves into oblivion, going missing for days afterwards. Why then, according to Gripper, was five shillings worth of beer paid as a bonus for every length of tunnel completed? Combine that with the impossibly-high risks involved in the work - excavating ground above your head with a pick, for example - and a perfect storm brews. What I personally find most inspiring was the Victorians’ apparent fearlessness. No matter how daunting the difficulty, they never seemed fazed by it, even if financial ruin loomed. Most of our tunnels were accomplished without any mechanical aids beyond those worked by muscle. Consider a typical two-track tunnel, advancing forward in sections - known as ‘lengths’ - of 15 feet. For each length, a gang - comprising a ganger, three miners and nine labourers - would excavate perhaps 180 cubic yards of material, supporting the ground with 20-foot long timbers propped off transverse beams. Four bricklayers and six labourers would then take over to form the lining, consuming huge quantities of mortar and possibly 30,000 bricks. Remember, these had to be manufactured and transported, not just laid. And all this took place at height, in choking bad air and constrained by darkness. Each length took two weeks. The final act involved a boy creeping into the space above the brickwork to pack the voids. Then the process would start again. Piles of bricks - moved by horses and carts - underline the logistical challenge facing the engineers driving Saunderton Tunnel. The logistics were mind-boggling, most of the strain being taken by horse power. At Saltwood on 16th September 1842, horses hauled 4,916 water barrels (each 1,310lbs) and 464 spoil skips (1,050lbs) - collectively weighing 3,092 tons - up nine working shafts, a total lift of 555,192 feet (105 miles) for a cost of about £37. You will have gathered by now that I am a tunnel junky and have an anorak to prove it. But there can be no denying that the stories they tell are compelling, if only we could bring ourselves to listen. Yes, let’s celebrate Crossrail and the first-class cutting-edge engineering it represents. We should though not lose sight of how it all started. Without the immense sacrifices made in the pursuit of progress - burrowing through hills - and the resolve shown during construction, we would have no railway network. To see how they did it, click the image below.